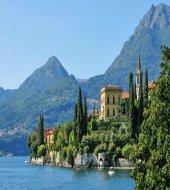 Discover Lake Como in Italy's beautiful Lake District, just a short distance from Milan. Nestled between the huge snow capped Alps that rise up from it’s shores, is fashionable lakeside town Como. After spending time shopping and dining, you will take a two-hour panoramic cruise on Lake Como to the enchanting village of Bellagio. Lake Como is the third largest lake in Europe and is surrounded by stunning alpine scenery and beautiful villages famed for their high quality silk production. On your cruise, admire the lakeside villas and keep an eye out for Villa d'Este at Cernobbio, a luxurious hotel set in tropical gardens. The mild Mediterranean climate ensures an abundance of exotic and rare plants thrive year round. Docking at the town of Bellagio, one of the most famous towns on the lake, you can follow the steep alleys running up from the lake and stop for a coffee or gelato at one of the lively cafes housed in grand historic buildings. In the afternoon, return to beautiful Como to enjoy a guided walking tour. 09:30 Arrival at Como, stop to visit S. Abbondio church. Visit of the city centre and free time for shopping. 1-4 to 30-10: Daily at 8:30. 1-11 to 31-3: Wednesday and Saturday at 9:00. Only in English. English only (Tuesday, Thursday, Saturday); English and German (Monday); English and Spanish (Wednesday and Sunday); English and Portuguese (Friday).